If you are looking for a traditional method for piping foods, this Ateco 3218 decorating bag is the product for you! This 18" canvas bag is great for piping drop cookies, mashed potatoes, or even thick dough. Due to its canvas construction, this bag will withstand heat and is designed for heavy-duty use, although it is not recommended for use with fatty or greasy products. Whether you're decorating at a commercial bakery or for a catered event, this pastry bag is a reusable option to help you lessen your environmental impact. This 18'' pastry bag is a very good quality cotton item, but it needs to be drying, after use, in the dryer, not by itself. At first I was shocked how large the piping hole is. I mean huge! (I could fit my thumb through it with room to spare.) Fortunately I had ordered a large open start piping tube to go along with it. I was able to accomplish my task with the bag and tube, but I need a large coupler. Don't forget to order one with this bag. Also, I wasn't expecting a coating-less bag. But it held up to a buttercream, so we'll give it a go. Great for decorating those tasty cakes and pastries. No frills, but it does the job and doesn't complain. Get one if you like good things. Nothing like working with the right products. This pastry bag is excellent for the work we do at our store. it is well made and price right. We will keep buying it. Exactly as described. Works great for getting a grip on your pastry bags. Much cheaper than at my local supply stores. Just as I expected, clean neat good product, and what I was looking for. Bags are not coated, so butter seeps through quickly. Also, can not cut to fit. Limits usability. Very strong bag though if it meets your application. Average pastry bag. Works way better with thicker icings. The thiner ones will come through the bag and make a huge mess. Will not purchase again. I love these bags to pipe my soap frosting onto my cupcakes, bars and cake slices. Economical and can reuse over and over again. Great quality! Tonight I used my 18" pastry bag to pipe mashed potatoes on top of my shepherds pie ... It was just big enough for the job and I did not have to refill it ... Very easy to use and a much more creative way to add potatoes ... I am very happy with my pastry bag . I'm not sure the purpose of a canvas bag with no internal lining. Moisture from the frosting would leak through the canvas. The only way to clean it thoroughly is to wash it in a wash machine and then the material frays. Maybe I'm using this wrong but it is no good for my purposes. Thank you for your feedback, Angela! We are sorry you did not prefer these pastry bags, this Ateco 3318 18" Plastic Pastry Bag might better suit your needs! I have been looking for this for years!!! We use this to make cream puffs! The big bag allows us to not have to refill often. However, due to the size, it can be difficult to grip for petite users. 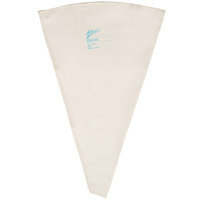 Very sturdy pastry bag, I have used it multiple times and it washes up very well. It is great to have a product that can be reused rather than going to our landfills to harm our beautiful planet. Love these bags. Great size canvas pastry bag that is of good quality. It holds up to our everyday use, cleans very easily and dries quickly. Would recommend. Much cheaper than the store and less wasteful than plastic as well. This is a strong pastry bag for an excellent price. The canvas allows for heavier foods to be piped out without ripping. Solid 18 inches for many items. Absolutely love his bag!! The size enables me to spend less time repacking my bag when I have large orders or cakes!! The canvas is sturdy and I don't have the issue of my tip falling through when I squeeze too hard like with some of the plastic bags. Great size for decorating. Easy to clean. Does not hold on to smells. The bag dries very quickly. Highly recommend this item to any baker! 18" Ateco pastry bag is nice and big, but for my butter cream/ shortening frostings it is not the best, the frosting seeps through and the bag becomes slimy feeling. It's nice to have a canvas pastry bag that just needs to get washed after each use. We use this regularly and never have any issues. Another great Ateco pastry bag. This canvas pastry bag is just the right size for all our needs. Its sure to last us a long time. Useless to me. This is a very well constructed pastry bag and is very high quality. But every adaptor i currently own will not allow me to screw the tube holder down (the end seam is too thick). I even purchased like 5 different size adaptors hoping one would work. But to no avail. But im just disappointed. I dont like the disposable bags or the plastic lined fabric ones. Plus if i cut this bag it would start to fray at the end that was cut. So i guess this will be in a storage box in one of my storage rooms. This is a very well made ateco 18" canvas piping bag. It is very good for piping dams, or completing large orders and holds up to everyday use. This is a nice, large sized pastry bag that will surely hold up well over time. Good cloth and plastic, with solid stitching. I recommend it. I use a lot of pastry bags, and really love these heavy duty canvas ones by Ateco. They are very durable, hold a lot of icing at this 18" size, and are comfortable to hold for extended periods of time. I use these for piping ruffles and roses on my cakes, as well as for doing buttercream tops on my cupcakes. They wash up well, and overall are a great piping bag. This Canvas Pastry Bag is perfect for anything. You can use it for Cookies. Cakes, ice Cream decoration, Whipping cream. Buy few more extra to use same time with different colors. So you don't have to wash. Heavy duty bag for a lifetime to use. 5 Stars. This bag is how it is described, I was just expecting it to be coated so the liquid/sugary/stickiness doesn't seem through when I use it for fresh whipped cream. It is a nice big size, I just ordered the wrong type bag. This bag does work well with all of our tips. This is a good bag for larger "stiff" frostings. They are not very friendly when it comes to clean up though, the canvas is very sticky and the whole is rather large. I must say that this is my favorite piping bag by far. It is so convenient. I think this one is great for large quantities of cupcakes and cakes. Highly recommended. we ordered the pastry bag and i wasn't is it will be good enough to use. since we received them i am putting them in a good use. i wash them after each use . i like it . You can't go wrong with Ateco brand products. I love the size for piping cupcakes and cakes. It is easy to hand wash and dry. This canvas pastry bag is perfect for hot applications. It is very sturdy and is one of the most used items in our kitchen on a daily basis. Just like the 16" these are great for an assortment of uses in the kitchen. We also used these for our mashed potatoes, whipped cream, guacamole, sour cream, butter, and a few other things to jazz up our dishes. Great pastry bag that can be reused over and over again. Can be easily washed, turn inside out. To save money from purchasing plastic disposable for everything buy one of these instead, Eco friendly. Very durable and easy to clean. We really like this product and will continue to purchase this brand. We have found that it really holds up to everyday use. This is a great size for holding lots of frosting/filling etc. Unfortunately because of the nature of canvas if you have a shortening & butter frosting the grease seeps through the bag making it slippery and unpleasant. I made the mistake of filling it with an all shortening buttercream when decorating a dummy cake and it was less than enjoyable feeling. I recommend the disposable pastry bags made by Ateco for high fat frostings, but this is a great tool to have for other types of creams. Love that i can wash it, dry it, and store it again for another use. Great pastry bag. Durable, easy to clean. We use for tartar sauce for crab cakes and to fill mashed potatoes on Sheppard's pie. Be careful hen using hot item in this bag as it is jot heatproof and will burn your hands. The Ateco Canvas Pastry bags are made to last. Very thick canvas material, heavy duty seams. The only thing you need have to keep in mind is the size of the tip. This extra large bag was great for frosting a very large batch of cupcakes. Because of the fabric I could not do marshmallow frosting but the buttercream worked great! Would recommend. Sturdy, washable, durable... what else could you ask for in a pastry bag? Just keep in mind that this is canvas and somewhat porous so if you have a dense filling that requires a lot of pressure, you may get some seep-through on the exterior. However, for icing, mashed potatoes and similar consistencies, this is the way to go. This pastry bag has a much better hand feel tha some of the plastic ones. It also feels heavy duty. For projects where I'm worried about scent transfer, I might still use disposables. I like to decorate cupcakes, and the 18" pastry bag is a good size for me. The bottom opening is large enough for the large tip adapter. Unfortunately, frosting can soak into and through the canvas, and it's difficult to be sure the canvas is thoroughly clean when I'm washing it. While it works for now, next time I will try a pastry bag made from a different material. Thanks for your review! If your want an easy to clean bag made from a different material, check out the Ateco 3318 18in. Plastic Pastry Bag. Another way to ensure that you have a clean bag every time is by using a disposable bag, like the Ateco 4718 18in. Disposable Pastry Bag. this canvas pastry bag is well made bag . it will stand up to any pastry tube. easy to use and clean up at a very loe buy. This is a good bag, and it's got plenty of room for a fair amount of filling. It cleans up well, and doesn't leak. It's strong enough to pipe stiff batter, like for cookies, too, without bulging or ripping, like some plastic bags. Unfortunately, it does not take all sizes of couplers or tips. It only takes the jumbo tips and couplers, so no compatibility with the frosting tips I bought. I'd say good for piping cookies or eclairs, etc, but not for frosting or fine work, since the bits won't fit anyway. SUGGESTION to Site: Clearly mark all bags, liners, tips and couplers as being Small, Medium, or Large, so we can know up front if they'll fit together. I've placed two orders so far, trying to match up, but still have tips that fit nothing else. Thanks for your review! We agree that you should be able to clearly know which items work together. We are working to update our content so that you may better find the items you need. This piping bag is so durable and it can be used to pipe on anything. It can stand up to so many different substances. I use it to pipe on my key lime pies. Though this bag doesn't offer the decorating potential of the smaller bags, it is still absolutely perfect for making roses or other decorative art! These also come at a great price! These Ateco piping bags are great because they can withstand heat and make piping hot potatoes easy! They can easily be turned inside out and washed to be used again! Great product, very durable and useful for the kitchen. Pipes everything mash potatoes, mousse, butter, and easy to clean as well because it is made of canvas. This is great bag for frosting cupcakes! It is really sturdy and well made. It washes really well and fits my large piping tips. Definitely a good purchase! This is an excellent bag- it's durable and sturdy, and the coating makes cleaning it as breezy as is possible with a reusable bag. Plus, it's not SO sturdy that it's inflexible. These are great decorating bags! They work well and clean up very easily. I was worried at first they I wouldn't need such a large bag but it works well with macarons and for fillings.